, second earl of Egmont, and son to the preceding, was born at Westminster, Feb. 24, 1711; and after a learned education at home, and the advantages of travelling, was chosen in 1731 (though then under age) a burgess for Harwich; and on Dec. 31, 174T, unanimously elected representative for the city of Westminster; as he was in 1747 for Weobly in Herefordshire. In March 1747, he was appointed one of the lords of the bedchamber to Frederick prince of Wales, in which station he continued till the death of that prince. In 1754, he was elected a member of parliament for the borough of Bridgwater, in the county of Somerset; and on January 9, 1755, was sworn one of the lords of his majesty’s most honourable privy-council. 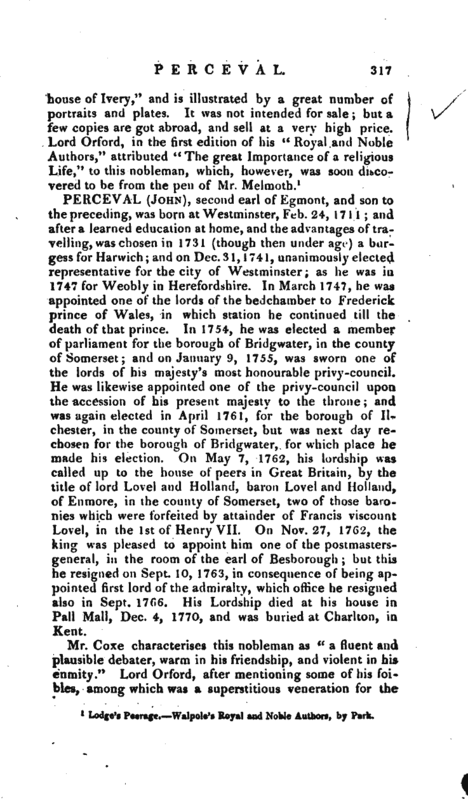 He was likewise appointed one of the privy-council upon the accession of his present majesty to the throne; and was again elected in April 1761, for the borough of II­chester, in the county of Somerset, but was next day rechosen for the borough of Bridgwater, for which place he made his election. 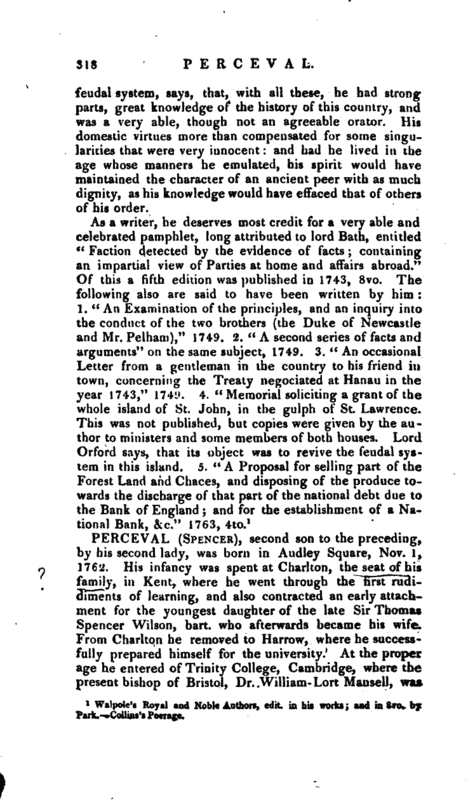 On May 7, 1762, his lordship wa* called up to the house of peers in Great Britain, by the title of lord Lovel and Holland, baron Lovel and Holland, of Enmore, in the county of Somerset, two of those baronies which were forfeited by attainder of Francis viscount Lovel, in the 1st of Henry VII. On Nov. 27, 1762, the king was pleased to appoint, him one of the postmastersgeneral, in the room of the earl of Besborough; but this he resigned on Sept. 10, 1763, in consequence of being appointed first lord of the admiralty, which office he resigned also in Sept. 1766. His Lordship died at his house in Pall Mall, Dec. 4, 1770, and was buried at Charlton, in Kent. Mr. Coxe characterises this nobleman as “a fluent and plausible debater, warm in his friendship, and violent in his enmity.” Lord Orford, after mentioning some of his foibles, among which was a superstitious veneration for the | feudal system, says, that, with all these, he. had strong parts, great knowledge of the history of this country, and was a very able, though not an agreeable orator. His domestic virtues more than compensated for some singularities that were very innocent: and had he lived in the age whose manners he emulated, his spirit would have maintained the character of an ancient peer with as much dignity, as his knowledge would have effaced that of others of his order. Walpole’s Royal and Noble Authors, edit, in his works; and in 8vo. by Park. Cullins’s Peerage.